Calling all high school coders who live or attend school in California’s 11th Congressional District! Do you enjoy coding? If so, here’s a contest for you to design, create, and submit your own software application for any platform (mobile, web, desktop, etc.). Students may compete as individuals or in teams of up to four. Submissions must be original, and created within one calendar year of the closing of the submission period. Students entering the competition must submit a short video demonstration explaining their app and a completed questionnaire online by 12:00 p.m. EST on November 1, 2017. YOU can be a reporter! Hey Kids, If you are 14 or younger and you’d like to be a reporter, enter the Time for Kids contest! Write an essay, 50 words or less, on why you would be a good reporter for Times for Kids and submit your own news article. Next year’s team will continue the tradition of reporting local and regional news stories for TIME For Kids magazine in print and digital and for TIME Edge. Professional journalists from TIME For Kids will select this team. In the past, TFK Kid Reporters have . . .
★ Interviewed national leaders, celebrities, and other newsmakers. ★ Written news stories, reviews, and opinion pieces for TIME For Kids and TIME Edge. ★ Learned about the news business from award-winning journalists. ★ Appeared on television to talk about their work. 1. Be sure to read the official rules and share them with your parent or guardian. Include a report you’ve written about an interesting or unique event in your school or community. The story should include a headline plus quotes from people you’ve interviewed. 2. Download the entry form below and have your parent or guardian sign the form and submit it electronically. Entries must be submitted by June 19, 2017. You must be 14 years of age or younger on September 1, 2017. Contest deadline: 12:00 P.M. ET on June 19, 2017. Zachary’s Art Contest is officially up and running! How Does the Art Contest Work? The subject of the artwork should be Zachary’s Chicago Pizza and the artwork should include either our logo and/or name. You may use the medium of your choice, but we recommend VIBRANT, SATURATED choices like paint, dark pastels or digital art. Colored pencils and crayons tend to get washed out against other pieces in our restaurant. Please remember, some of the art will be hanging up high so utilize the space you are given. Fill it up and make it bold! We are accepting four different sizes for art pieces (26 x 26, 24 x 36, 32 x 32, 36 X 48). 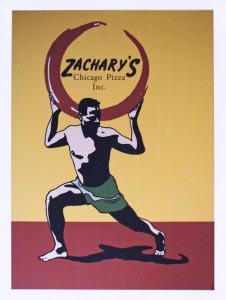 Pre-cut paper is available at any Zachary’s location. 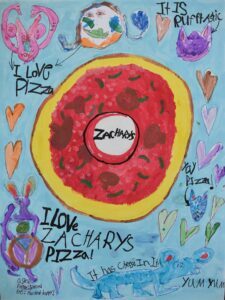 All winning artwork and any reproductions of the artwork become property of Zachary’s Chicago Pizza and will not be returned. Visit http://zacharys.com/zacharys-art/ for more information. You can also see examples of their winning entries on the walls at their locations. Calling all Contra Costa County Artists! Design and Create Contest! The Arts and Culture Commission of Contra Costa County is seeking a new Arts Recognition award. This award honors individuals and art organizations whose work has had a significant impact in Contra Costa County. We are seeking an artist from Contra Costa County to design and create an original art piece that can be duplicated. Recognizing that original art does vary from piece to piece, we request that several “awards” can be made that are similar in size and shape.